modranska is a company focused on creating handmade pottery, mainly faience and earthenware. In cooperation with local potters from the town of Modra and designers from all over Slovakia, we aim to resurrect traditional shapes and patterns, as well as come up with new fresh designs and thus create original and modern ceramics respecting the traditions and beauty of old pottery from this region. 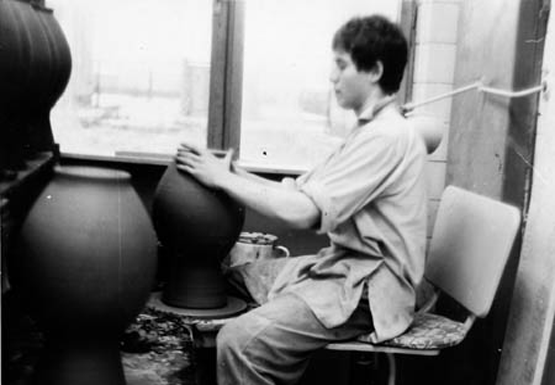 Our story began back in 1975, when Marián Liška started as an apprentice in the famous Modra school of ceramics. After finishing his studies, he stayed at the School and worked as a potter and later on as a tutor. In 1990, he established his own workshop which has later on provided the basis for the creation of our workshop. The present appearance of modranska is due to the influence of Marián’s son Jakub, who returned to his father’s workshop in 2009 after completing his studies of ceramics, architecture and design at ŠÚV and VŠVU in Bratislava and at the University of Plymouth and has brought along new practices and ideas. The biggest amount of work gets done in our team. We are proud to have the opportunity to work with outstanding craftsmen and designers whose work has been recognized by several national awards for design, awards for the best potters, or at competitions and exhibitions all over the world.